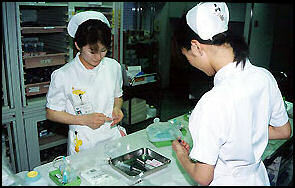 Japanese nurses In Japan and China rates of heart diseases are low. Stroke is a big problem though. It accounts for a large proportion of deaths. There are currently 7 million Japanese with diabetes. The rate is expected to reach 10 million in the next ten years (See Food). About 67.2 million Japanese wear glasses (corrective lenses). About 65.6 percent of Japanese high school students are near-sighted. Some have attributed this to the strains of reading Chinese characters. Paris Miki is Japan’s No. 1 eyeglass maker. A lot of Japanese have athlete’s foot, a trait attributed to bath culture in Japan. One in ten Japanese children develop fewer than normal teeth according to the Japanese Society of Pediatric Dentistry. The finding raises concerns about the need for expensive straightenings or implants. Japanese encephalitis has been nearly eradicated in Japan but is still found elsewhere. Epidemics of dengue fever occurred n Osaka and Nagasaki in the 1940s. Mosquitoes that transmit dengue fever were found in Akita and Iwate prefectures in 2005. Malaria-producing mosquitos have been found breeding at Kansai airport. Japan has a relatively high rate of tuberculosis: 19.8 cases per 100,000 people compared to 4.5 per 100,000 in the United States and 13.5 per 100,000 in Britain. Attention was brought to the problem in 2009 when a famous female comedian, Haruka Minowa, came down with the disease and there were worries he might have passed it on to people in the audience of her shows. Japan experienced a rabies epidemic in the early 20th century. For a while beriberi, caused by a deficiency of thiamine (Vitamin B1) was rampant in the Kobe-Osaka area and every year from summer into autumn entire families came down with it. People received vitamin injections to fight it. There are an estimated 2 million people with hepatitis C in Japan. Some of them contacted the disease from tainted blood products such as unsterilized coagulant fibrinogen produced by Green Corp from blood pooled from a large number of people. The Japanese government has been widely condemned for allowing the products to be manufactured even though it had been warned by the U.S. FDA that such products were risky. The antibiotic resistant “superbug” acinetobacter bacterium struck several hospitals in the Tokyo area in the summer of 2010, killing several people. Some hospitals were sharply criticized for taking months to reports the presence of the microbe. In 1950 tuberculosis was the leading cause of death in Japan. That year it killed 121,769 people---or 146.4 per 100,000 people. In 2007, a total of 2,188 people died of TB, 1.7 per 100,000. It was ranked 27th as a cause of death in Japan in 2008. Each year 280,000 men and 200,000 women develop cancer in Japan. The rates of stomach cancer are very high. The rates of breast cancer are much lower in Japan than they are in the United States and other industrialized countries. Japan was once regarded as the world leader in cancer screening. In the 1960s, mass gastric cancer screening was employed for the first time, using X-ray vehicles that brought the screening to different locations so cancer could be detected in its early stages. Later similar strategies were employed for uterine, stomach and womb cancer. In the early 1980s mass screening backed by government subsidies was introduced for lung, breast and colon cancer. In 1998 when the burden of supplying subsidies for cancer was switched from the national to local governments, some local governments kept the programs going but others slacked off. The rates of screening and the quality has declined and now Japan lags behind many other industrialized countries in cancer screening. Sexually transmitted diseases are increasing. The rate of gonorrhea has increased 32 percent and chlamydia has increased 36 percent in recent years. Many of the early AIDS victims were foreigners, particularly women from Southeast Asia who came to Japan to work as prostitutes. In August 1994, a 24-year-old gay man named Toshihiro Oishi was one of only four people in Japan who admitted publicly to being infected with the AIDS virus. In 1997, Japan had 255 AIDS cases and 6,700 HIV-infected people. Health officials say the incidence of AIDS in Japan is relatively low because drug abuse is rare and since the birth control pill is banned for health reasons, condoms are the most common form of birth control. In the 1990s about 60 percent of the AIDS patients and H.I.V. carriers in Japan were hemophiliacs who were infected with contaminated blood before 1985. The first person to announce he had AIDS publicly in Japan was a hemophiliac named Noriyasu Akase. After he admitted to having the disease, his wife was fired from her job as a nurse. Later she found new jobs but was fired six more times after her employers learned who her husband was. The Japanese are very paranoid about AIDS. An openly gay playwright with AIDS was denied accommodation in 18 Tokyo hotels. When a conference on AIDS was held in Yokohama---in which 1,000 of the 10,000 people attending had AIDS---government officials distributed a videotape that showed it was impossible to get AIDS by handling the luggage of infected guests or cleaning their rooms or serving them in a restaurant. 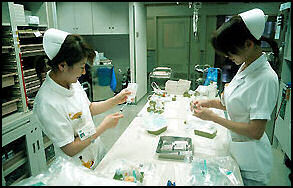 neonatal care More than 1,800 of Japan's 5,000 hemophiliacs contacted the HIV virus between 1983 and 1988 with blood products that the government knew could be tainted. The products had not been heated at a temperature that kills the HIV virus even though the company that produces them, Green Cross, knew that such heating was necessary to kill the virus. Government officials had been aware of this since 1983 but they continued to authorize the use of the products until 1985. By 1997, 400 of the hemophiliacs had died and several families had field lawsuits. The Health Ministry tried to cover up their involvement in the scandal, which was publically reveled by Diet representative Naoto Kan. After it was revealed the Ministry of Health knew about the tainted blood products a top hemophilia expert, a Ministry of Health bureaucrat and three former blood-supply company executives were arrested. Three former presidents of Green Cross were given prison sentences of two years for professional negligence. The judge ruling on the case said that the executives placed profit above the health of the people that used their products. There are about 3.5 million people in Japan have hepatitis B and C and 2 million people have hepatitis C.
People who had contacted hepatitis C through tainted blood products filed a class-action suit against drug makers and the government for failing to prevent the infection, demanding compensation. Many of those involved contacted the disease from tainted fibrinogen, a blood product that acts as a coagulant administered to stop bleeding after the delivery of babies and after operations. A total of 207 people were involved in the class action suit. About 10,000 people were infected with Hepatitis C were given fibrinogen. Of these about 1,000 could prove they got the disease from tainted products (namely fibrinogen). Up until the 1990s fibrinogen was given to nearly 300,000 patients. At least 57 people were infected with the hepatitis C virus after heart surgery in which a surgical adhesive called fibrin glue, made with fibrinogen, was used. About 79,000 patient were given the adhesive between 1982 and 1987. The government and the producer of fibrinogen---The Green Cross Corp.”offered compensation to the plaintiffs involved in the class-cation suit. The plaintiffs said that wasn’t good enough; they wanted uniform compensation for everyone who contacted the disease from tainted products. In December 2007, Prime Minister Yusuo Fukuda said that legislation would be drawn up to pay a uniform compensation to all hepatitis C sufferers who could prove they got the disease from tainted products. The 207 plaintiffs drew a lot of publicity to their cause, and got the Prime Minister to make a decision in their favor as his approval rating was sliding. The wording of the ruling however was vague and covered only the 1,000 who could prove they got the disease from tainted products. The average compensation was around $20,000. Fukuda met face-to-face with the plaintiffs in the class action suit and apologized to them. Hepatitis sufferers paid ¥12 million to ¥40 million. Only 13,000 people hepatitis sufferers received benefits. In September 2008, a deal was made between the hepatitis C sufferers and Mitsubishi Tanabe, the successor of defunct Green Cross, in which the company accepted responsibility, apologized and promised to try and develop an anti-hepatitis drug. In January 2011, hepatitis B sufferers agreed to accept the settlement. In March 2008, 14 people contacted hepatitis B or C at a hospital in Shimane Prefecture from a machine that took blood samples with used needles. Thirty-seven patients had blood samples taken with the machine. Nurses who operated the machine thought it changes needles atomically. There was great concern about SARS in Japan during the SARS outbreak in 2003. Even so not a single SARS case was reported. The nation was put on high alert. People arriving from countries with SARS cases were screened when they arrived in the country with a devise that visually measured their body temperature (SARS sufferers have fevers). Concerns were raised when a Taiwanese doctor came down with SARS after traveled around Japan for a week as part of a group tour. Every place he visited, every mode of transportation he took and every person he was known to have come in contact with was checked out and in many cases sprayed with virus-killing chemicals. SARS was big news. There were stories about it everyday in the newspapers and on television. Plans to boost tourism in Japan were dealt a serious blow. Airlines and travel companies lost a lot of money as the SARS scare occurred during the busy Golden Week and summer vacation season. Japan has major contingency plans for a major flu outbreak and has conducted elaborate drills to address such an event. Quarantine drills have been conducted on planes. Multinational plans with China and South Korea have been developed. Laws have been passed to restrict the movement of people during an outbreak. An effort has been made to stockpile large supplies of Maiflu and other flu medicines and develop cell cultivation technology to produce quantities of vaccine able to innoculate an entire population. In January 2009, researchers at Hokkaido National Institute of Infectious Disease and Saitama Medical University said they had developed universal flu vaccine that cold be the silver bullet against new strains of the virus. Avian cases of bird flu were reported in February, 2004. The first cases were at poultry farms in Yamaguchi and Oita Prefectures with the serious cases in Kyoto and Hyogo prefectures. Hundreds of thousands of birds, mostly chickens, died of the disease. Farms were sealed off. Hundreds of thousands of birds were culled. The military was deployed to sterilize vehicles. Most of the culling was done by government health officials who killed the birds by placing them in bags filled with carbon dioxide. The bags were then buried. It was the first outbreak of bird flu since 1925. In December 2004, it was revealed that one Japanese person had bird flu and four others probably had it. Health officials said that maybe hundreds came down with the disease but displayed no symptoms. The disease was picked up in the outbreak in February and March and was detected later using test that measured the production of antibodies to the disease. The people who go bird flu are believed to have picked up the disease from contact with chickens with bird flu. No one died or was even seriously ill.
Mad Cow Disease, BSE, See Livestock. Bird flu was reported in Okayama and Miyazaki Prefectures in January 2007. A number of chickens died. Tens of thousands were culled, Some 2,400 chickens killed at a poultry farm in Miyazaki Prefecture. Farms within a 10 kilometers radius of the farm with the dead chicken were prohibiting from shipping chickens or eggs. In April 2008, H5N1 bird flu was detected in three dead or dying swans in Lake Towada in Akita Prefecture in northern Japan and the Notsuke Peninsula in eastern Hokkaido. Another dead swan with H5N1 was found in Hokkaido in August 2008. People became alarmed at Japanese bird sanctuaries, zoos and poultry farms after several species of migratory birds in different regions were found dead and infected with the highly infectious and lethal H5N1 avian influenza, or bird flu. The problem then spread to poultry farms, requiring the culling of hundreds of thousands of birds to bring the problem under control. Bird-related events, such as Emperor penguin walk at the Osaka Aquarium, and chick-petting at zoos were canceled. At zoos there were worries that endangered species as well as humans might contact the disease. In December 2010, bird flu was found among dead swans in Toyama Prefecture and Tottori Prefectures and was also detected among dead rare white-naped cranes and hooded cranes in Kagoshima Prefecture. In Toyama Prefecture, a dead mute swan led to inspections of nearby poultry farms and a decision by a park in Hyogo Prefecture, on Japan’s Inland Sea, to stop displaying its white storks, a national treasure, for fear that they would come into contact with infected wild birds. In Tottori Prefecture, a wild tundra swan was found on a house balcony dying of what was tentatively identified as the bird flu virus. Late the disease was found on a poultry farm about six kilometers away. That set off a search of the area, turning up 23 more dead birds, which were tested for bird flu. A hooded crane was found dead of H5N1 on the Izumi Plain in Kagoshima Prefecture in southern Japan, several hundred miles south of Toyama and Tottori. The plain is Japan’s largest wild crane wintering site, and the prefecture is the nation’s top poultry-raising area. In November , H5N1 bird flu was found in chickens in Shimane Prefecture and in the feces of wild ducks in Hokkaido. More than 23,000 chickens were killed in Shimane. The chickens were believed to have picked up the flu virus from a small wild bird infected with the disease found at the farm with the infected chickens. In January 2011, bird flu was found at poultry farms in Miyazaki Prefecture near Kagoshima. More than 410,000 chickens were culled there. One-hundred-seventy soldiers in Japans’s Ground Self-defense Force were dispatched to help bury the birds. In Aichi Prefecture near Nagoya 150,000 chickens were culled after infected chickens were found at a poultry farm there. At around the same time the disease appeared in Izumi, Kagoshima Prefecture near where the infected cranes had been found. That area has 5.22 million chickens in 162 poultry farms. About 8,600 chickens were culled there and the transportation of eggs and chickens within a 10 kilometer radius of the area where infected birds were found was prohibited. In February , 13,000 chickens were culled in Oita Prefecture when brid flu was found there. Despite great efforts to keep the disease out of the country, the H1N1 flu (erroneously known as swine flu) struck Japan. The first cases---three students and a teachers who arrived at Narita airport from a school trip to Toronto, Canada and the United States---were in early May 2009. By mid May there were over a 170 confirmed cases. In early June, a month after the disease was first reported, there were 438 cases. By early July there were 1,500 cases. The death toll from A/H1N1 flu was very low in Japan : 149 in a population of 127 million comparted to over 10,000 in the United States, where et population is 307 million. People arriving in Japan from abroad at airports and ports were checked using devises with infrared thermography that could detect if the people had a fever. Some airports conducted flu tests on board the planes. People with the disease or sitting near people with the disease were quarantined and placed in designated medical facilities. An American quarantined because he sat near a diseased passengers on plane said he was treated well and given good food in the quarantine center. Schools and tourist postponed foreign trips. Sales of air purifiers soared and the smell of disinfectant filled airports. People were taught how to properly wash their hands. Hospitals set up special “swine flu departments” and researchers were ordered to make a vaccine. Mask sales were brisk. Stores ran out of them Companies that made mask worked around the clock to meet foreign demand. Tamiflu was sold at inflated prices on the internet. Arriving international travelers were ordered to provide personal details about themselves. People complained of having to wait two hours during airport quarantine checks. Foreigners visiting Japan fell off by a third. More than 4,700 schools and kindergartens were closed in Osaka and Hyogo Prefectures after dozens of students were confirmed to be infected with the disease. A total of 1,323 primary schools, 915 middle schools, and 47 high schools were closed for a week, affecting 1.34 million students. Many thought the decision was an “overreaction.” The decision was made in part because there were so many unanswered questions about the disease, namely that many of those who were infected had not been overseas or had contact with people who had been overseas. In Japan, most of those who came down with the flu were high school students. Most of the cases were in Osaka and Hyogo Prefectures. No one died. Concern about the disease slacked off when nobody became seriously ill and it was determined the flu was “about the same” strength as normal flu. It was not clear how the flu entered Japan. Many think a foreigners slipped through the quarantine arrangements set up at ports and airports and infected people in Japan. The disease spread as quickly as it did because many of those who initially had it were thought to have the seasonal flu and were not quarantined because they hadn’t been abroad. The first death from A/H1N1 influenza---a 57-year-old Okinawa man with heart and kidney illness---occurred in August 2009. As of mid December 2009, 15.46 million Japanese had come down with the disease. At that time 122 people had died or we suspected to have died from it. Among those who died were people with health problems that had been vaccinated. Flu shots for the A/H1N1 flu began in late October 2009, with the first batch going to 1 million people who work in hospitals and other medical facilities. In early November the next round went to 1 million pregnant women and about 9 million people with pre-existing medical problems. By December pretty much anybody who needed a shot could get one. In October 2009, 20 percent of middle schools were closed because of the flu. A lot of school trips, sports and cultural festivals and other activities were cancelled because of the disease. For many years leprosy patients were removed from their families and sent to a special sanitarium on Oshima Island in the Inland Sea in accordance with the Leprosy Prevention Law, which was in effect from 1907 to 1996. The leprosy victims were often shunned by their families, who never wanted to see them again after they were sent to Oshima Island. Many were sterilized. Women got pregnant were forced to undergo abortions and sometimes were handed the fetus in a plastic bag as a punishment for having a child. About one in 10 Japanese (13 million people) suffer from cedar hay fever whose season sometimes lasts from February to late May. You can tell its cedar hay fever season by the number of people wearing surgical masks and eye protection. The pollen season usually begins in late February in Kyushu and late March in Hokkaido and runs for up two months. Springs preceded by hot, dry summer usually have higher than normal pollen counts’sometimes over twice as high. The presence of cedar pollen depends on the growth of cedar bud the previous summer with high temperatures and low rainfall producing the most pollen. Particularly after a dry, hot summer huge clouds of cedar pollen fill the air, which causes an allergic reaction. In late February and March, when the pollen concentrations are at their highest, the pollen count is flashed on billboards in Tokyo and shown on television weather reports. Allergy hot lines receive thousands of calls. "At the peak, you can actually see pollen fog coming from the cedar forests," a Tokyo allergy specialist told the New York Times. "It is so bad that when people first began to notice this a decade or so ago they thought they were forest fires." The allergies are the result of too many cedar trees. One sufferer told the New York Times: "When I started suffering I wanted to scratch out my eyes. I finally realized that this was the result of the government's misguided reforestation policy." In some places old cedar trees are being cut down and replaced with species of cedar that produce less pollen. Sick-house syndrome describes a condition in which people have strong allergic reaction when spending time in certain kinds of houses. In most cases the houses are new and the allergic reaction are believed to be caused by chemicals such as toluene and formaldehyde used in paints, building materials and adhesives for wallpaper, plywood and flooring. The syndrome seems to affect children the most. Symptoms are generally similar to those of allergies. To avoid sick-house syndrome sufferers seek out old houses or houses made mostly of wood. The condition is so widespread and feared that education systems have been advised to make schools of wood and have good ventilation and circulation in the future. The system that deals with metal health needs some improvement. The suicide rate in Japan is very high. The average period of hospitalization for a mental problem is 390 days, compared to less than 10 in the United States. Talking cures are rare. Drug treatments are the norm. Mental illness and depression have traditionally been regarded as character flaws rather than an illnesses that can be treated. Few people seek out counselors, psychologist, psychiatrists, priests or Buddhist monks. An American psychiatrists in Tokyo told the New York Times, "Psychotherapy is extremely culturally bound. There is still an enormous stigma here in seeking help." There is a stigma attached to therapy of any kind. Depression sufferers worry about losing their jobs if their employer found out they were seeing a psychiatrist. One Japanese man told the New York Times, "Generally in our mind, grief is a private matter. We have to solve it ourselves, or with family." One survey found that one in three Japanese worry about getting depressed or becoming mentally ill, mostly in connection to workplace stress. The status of psychiatrist is low. Mental health facilities consist of depressing mental hospitals, where patients are treated with high doses of sedatives and often placed in physical restraints. The use of antidepressant drugs is a relatively new phenomena Prozac wasn’t approved for use in Japan until 2004. Those that use these drugs often guilty or chided for being weak by family members. The Japanese traditionally have not had an expression for mild depression or moodiness. In the late 1990s the expression kokoro no gaze (“my soul has got a cold”) sprung up to describe to describe daily blues and mild depression. The number of depression cases more than doubled to 1 million between 1999 and 2008. The increase was attributed to economic problems, more people seeking help and great use of anti-depressant drugs. The Japanese word for depression, itusubyo, has traditionally only referred to serious depression or manic depression disorders and similar conditions that required being institutionalized. Mild depression was spoken more in terms of ki (vital energy) and was expressed with term like kig ga meiru (“my ki is leaking”) or ki ga omoi (“my ki is sluggish”) or ki ga fusag (“my ki is blocked”). Latah is a mental disorder found in Malaysia, Indonesia, Japan and Thailand is characterized nonsense mimicking of others and trancelike behavior experienced after a sudden fright. The expression kokoro no gaze mentioned above was introduced by the drug industry to sell anti-depressant pills. The Japanese drug company Meihi Seika Kaisha, who began selling the anti-depressant S.S.R.I Depromel in 1999, are credited with coining the expression kokoro no gaze. They decided to market the drug based almost solely on the fact that anti-depressants were so profitable in the United States and Europe. The next year GlaxoSmothKlien entered the market and used “education campaigns” to promote their anti-depressants. A spokesman for the company told the New York Times , People didn’t know they were suffering from the disease. We felt it was important to reach our to them. Depression is a disease that anyone can get. It can be cured by medicine. early detection is important.” The company listed “stiff shoulders” and “tired and lazy” as symptoms of depression and showed pretty women in their ads going t the doctor and feeling much better when emerged from the office. After that kokoro no gaze became a topical issue. The number of books about depression increased from 27 in the early 1990s to 177 in the early 2000s. The number of conversations on some online bulletin board on depression ranked with those on romantic love and outnumbered conversations on food and music. Doctors reported getting record numbers of people complaining about depression. There were some high profile cases like that of Princess Masako (See Emperor). The drugs companies raked in huge profits. Psychiatrists described the windfall in their business in bubble economy terms.